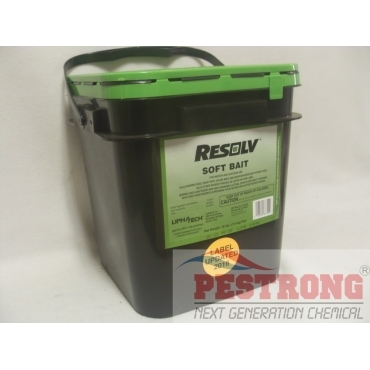 Where to Buy Resolv Soft Bait, Resolv Soft Bait Bromadiolone - 16 Lb Pail - $99.95 for Sale with Fast Free Shipping! Resolv Soft Bait Bromadiolone - 16 Lb Pail contains the most commonly used active ingredient, bromadiolone, in a superior, soft bait formulation. Resolv soft bait rodenticide gives you strong results while lowering your cost-per-placement expenses. Aroma escapes through the pouch to encourage feeding. It contains food grade oil and grains and is nut-free. Without seeds, resolv soft bait it reduces debris and service time. Bittering agent is added to help avoid accidental consumption. Can be secured using a feeding device or by using vertical or horizontal rods, reducing the chance of translocation by the rodents. Product labels allow the PMP to peel off paper and place the soft bait directly onto a feeding device. 16 Lb pail is packaged 604 x 0.42 ounce (12 grams) individual packs. Resolv is one of the best way to resolve the conflict you have with your tiny tenants, I usually don't get alone with rats, unless they are dead. This product help me get alone with these tiny creatures, and let me tell you how, it kills them, and it does it well.